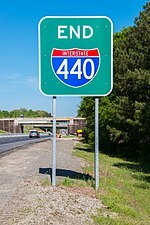 Interstate 440 (I-440), also known as the Raleigh Beltline, the Cliff Benson Beltline, or locally as just The Beltline, is an Interstate Highway in the US state of North Carolina. I-440 is a 16.4-mile-long (26.4 km) partial beltway that nearly encircles central Raleigh. I-440 begins in west Raleigh at an interchange with I-40, as a continuation of US Highway 64 (US 64)/US 1 and traverses a primarily residential area in west Raleigh. The freeway makes a turn toward the east, crossing US 70, Six Forks Road, and Wake Forest Road. US 1 branches north off of I-440 at Capital Boulevard (US 401), becoming US 401/US 1. I-440 turns toward the southeast and follows a brief concurrency with US 64 Business before intersecting I-87/US 64/US 264. US 64 is concurrent with I-440 along the remainder of the road's southwesterly routing. Exit 16 is the last exit on I-440, where I-440 splits to become I-40 East and West. I-440 was commissioned in 1991 along the Raleigh Beltline, pieces of which had been constructed since the late 1950s, with the first section opening between 1959 and 1960. The loop was completed in 1984 under multiple route designations. To avoid confusion along the beltline, I-440 was routed along the entirety of the beltline and shared a concurrency with its parent, Interstate 40, along the loop's southern segment (Tom Bradshaw Freeway). In 2008, the I-440 designation was removed from the section of I-40/US 64 in southeast Raleigh. The highway's original "inner" and "outer" designations were also removed and replaced with compass directions (e.g. east/west). I-440 begins on the western side of Raleigh at an interchange between I-40/US 1/US 64, heading northeast concurrently with US 1. US 1/US 64 continues to the southwest on the same freeway. The freeway has an interchange with Jones Franklin Road just over 0.5 miles (0.80 km) from its western terminus. Continuing northeast, the freeway runs between residential neighborhoods and has another interchange with Western Boulevard. From there, the freeway slowly begins to turn toward the north and completes the turn after a partial cloverleaf interchange with North Carolina Highway 54 (NC 54, Hillsborough Street). North of that interchange, the freeway continues west of Meredith College and east of North Carolina State University's Centennial Biomedical Campus. East of there, I-440 has a cloverleaf interchange with Wade Avenue, which provides access to PNC Arena and Carter–Finley Stadium. The freeway turns slightly to the northeast to have an interchange with Lake Boone Trail. Approaching US 70, the freeway makes another slight turn toward the northeast. An incomplete interchange at exit 6 serves Ridge Road, directly before the US 70 cloverleaf interchange at exit 7. From there, the freeway turns to the east and runs between more neighborhoods in the North Hills area of Raleigh. After an interchange with Six Forks Road, which provides access to the North Hills shopping center, I-440 turns southeasterly. The freeway passes south of Duke Raleigh Hospital after an interchange with Wake Forest Road. Continuing to the southeast, the freeway crosses over Atlantic Avenue along with a railroad operated by CSX Transportation. Turning again to the southeast, a cloverleaf interchange with Capital Boulevard (US 401) marks the end of the US 1 concurrency, as US 1 turns to the north. The freeway begins to parallel Crabtree Creek as it continues southeast. At exit 12, there are two incomplete exits: Yonkers Road is served by I-440 East, while Brentwood Road and Noblin Road are served by I-440 West. A partial cloverleaf interchange at exit 13 serves New Bern Avenue along with US 64 Business East. US 64 Business is concurrent with I-440 until exit 14. Immediately before reaching I-87/US 64/US 264 at exit 14, the freeway turns directly south. The freeway, along with several exit ramps, crosses over Crabtree Creek and a railroad owned by the Carolina Coastal Railway. US 64 continues concurrently with I-440 to the south. After an interchange with Poole Road, the interstate turns to the west along the southern side of Walnut Creek Park. Exit 16 is the last exit on I-440 and is used to serve I-40 East. I-440 East continues to the west another 0.7 miles (1.1 km) before terminating at I-40 West. US 64 continues concurrently with I-40. The Raleigh Beltline was planned in 1954 in the Land Development Plan of Raleigh, to serve as a belt road around the city. The first section was opened between 1959 and 1960, running north from NC 55 in Apex along the present-day US 1 freeway and western sections of I-440 to US 70 at Glenwood Avenue. The new freeway was signed as US 1 for the majority of the routing until Hillsborough Street, where US 1 turned to the east toward downtown Raleigh. The remaining 3.3-mile-long (5.3 km) section of the route, running from Hillsborough Street north to Glenwood Avenue, remained unsigned. In 1964, the northern section of the Raleigh Beltline was completed, running from Glenwood Avenue to North Boulevard (now called Capital Boulevard) where it met up with US 401. US 1 was then signed along the route from Hillsborough Street to North Boulevard, leaving its former routing through downtown Raleigh as US 1B. A 2-mile-long (3.2 km) section of the beltline was opened in 1965, running from North Boulevard to New Bern Avenue. US 64 was rerouted along the beltline from its present intersection with US 1 south of Cary to New Bern Avenue, where it turned toward the east. The former routing of US 64 through downtown Raleigh became known as US 64B. The route remained unchanged until September 1972, when US 70/NC 50 was relocated from its routing along Glenwood Avenue and placed along the beltline from the Glenwood Avenue exit to North Boulevard, where the two roads then turned to the south and followed US 401 into downtown Raleigh. In 1975, construction began on a new extension of the beltline, which was to run from New Bern Avenue southwest to Hammond Road in south Raleigh. By 1976, construction had been extended west to US 70/US 401/NC 50 (South Saunders Street). The first leg of the new construction was opened later that year, running from New Bern Avenue south to Poole Road. In 1978, the beltline was extended from South Saunders Street west to I-40, at the present day interchange of I-40 and Wade Avenue. In April 1984, the construction of the beltline along the south side of Raleigh was completed. US 70/US 401/NC 50 was rerouted from Downtown Boulevard (formerly North Boulevard, now called Capital Boulevard) along the east side of the beltline to South Saunders Street, where both routes followed the road south toward Garner. The route change left the former routings through downtown Raleigh as secondary roads. US 64 was removed from the northern side of the beltline and placed along the new southern side, from US 1 near Cary to New Bern Avenue. Interstate 40 was rerouted from present-day Wade Avenue and along the new construction before ending at US 1. In 1991, state highway administrator William G. Marley Jr. asked the Federal Highway Administration to call the Raleigh Beltline Interstate 440. On July 16, 1991, I-440 was officially designated as a new beltway running along the entirety of the existing beltline. The new interstate was cosigned with I-40 along the south side of Raleigh between exit 293/exit 1 – where I-40, I-440, US 1, and US 64 met near Cary – and exit 301/exit 16, where I-40 turned to the south. I-440 was also cosigned with US 1 from exit 1 to Capital Boulevard (formerly Downtown Boulevard). US 64 was also signed along a brief concurrency with both I-440 and US 1 from exit 1 to Western Boulevard, where it turned east toward downtown. US 70, US 401, and NC 50 were rerouted from their beltline designations through downtown Raleigh, causing worries about traffic on downtown streets. That same year, work began on a seven-year, $53 million project to expand the beltline to six lanes (three in each direction). Work in 1991 included widening a 3.6-mile-long (5.8 km) section of I-440 from Glen Eden Road to Wake Forest Road and rebuilding of the 30-year-old Glenwood Avenue bridge. Work began in early in 1993 to widen 4.4 miles (7.1 km) from Wake Forest Road to New Bern Avenue. On July 8, 1994, the state awarded the contract for widening 1.7 miles (2.7 km) to six lanes from Wade Avenue to Glen Eden Road. At that time, completion of the project's second phase was expected by June 1995, with phase three scheduled for completion in 1996. The 2-mile (3.2 km) section between New Bern Avenue and Poole Road were widened starting in 1996. Plans called for widening the section from Wade Avenue to I-40 several years later, but even after several delays, the 2006–2012 N.C. Transportation Improvement Program did not include funding for the $77.3-million upgrade. The project was considered complete in 1997 except for the delayed section; that work is scheduled to begin in 2018 or later. The original I-440 designation used "inner" and "outer" labels rather than east and west labels because the freeway made a full loop around the city. "Inner" was used to designate the clockwise direction around the beltline, and "outer" was used to designate counterclockwise. In 2008, State Highway Administrator W. F. Rosser asked the US Department of Transportation to remove the I-440 designation from the southern portion of the beltline, where it was cosigned with I-40. This decision was primarily made to prevent confusion of travelers who used the highway. On November 10, 2008, I-440 was officially truncated on the western end at the I-40/US 1/US 64 interchange in western Raleigh and at the I-40 interchange in southeast Raleigh. The inner and outer labels were also dropped and replaced with east and west designations. The Federal Highway Administration route log has been updated to show the shortened distance. By 2010, the entirety of the highway's signs had been changed to the new designation. I-440 was included in Project Fortify, a $130-million project to replace pavement along the southern beltline, which was crumbling due to a chemical reaction known as alkali–silica reaction (ASR). I-440 was included in the first phase of the project, which included replacing the freeway's pavement from the I-495/US 64/US 264 exit to the eastern terminus of the freeway at I-440. Lane closures on the approximately 2-mile-long (3.2 km) section of the beltline began in December 2013. The project's first phase was completed in early 2015, with the I-40 section of the project expected to be completed in 2017. The North Carolina Department of Transportation (NCDOT) has designated a 3.5-mile (5.6 km) stretch of Interstate 440, from Walnut Street to Wade Avenue, to be redesigned and widened to six lanes. Completed in 1960, it is the oldest section of the beltline; it features the original four lanes with minimal shoulders, substandard interchanges, and a merging left-lane on-ramp. A Purpose and Need Statement was completed in 2014 showing the need for the project through deficiencies in capacity, geometric (design of the roadway and interchanges), and road condition. NCDOT has estimated the cost at $92 million, with right-of-way acquisition to start in 2018. No official date has been set by NCDOT for the project start date. The entire route is in Raleigh, Wake County. ^ a b "Route Changes (1991-07-16)" (PDF). North Carolina Department of Transportation. June 16, 1991. Retrieved August 1, 2016. ^ a b Adderly, Kevin (January 27, 2016). "Table 2: Auxiliary Routes of the Dwight D. Eisenhower National System of Interstate and Defense Highways as of December 31, 2015". Route Log and Finder List. Federal Highway Administration. Retrieved July 22, 2016. ^ a b c d Google (December 28, 2012). "Overview Map of Interstate 440 in North Carolina" (Map). Google Maps. Google. Retrieved December 28, 2012. ^ a b North Carolina Department of Transportation; North Carolina State Tax Commission (2015). 2015–2016 State Transportation Map (Map) (2015–16 ed.). 1:823,680. Raleigh: North Carolina Department of Transportation. ^ Little, Ruth (August 2006). "The Development of Modernism in Raleigh, 1945–1965" (PDF). NC Modernist Houses. NC Modernist Houses. Retrieved July 31, 2016. ^ a b c "I‐440 Improvement Project" (PDF). North Carolina Department of Transportation. September 2014. Retrieved June 10, 2016. ^ Google (June 9, 2016). "Hillsborough Street to Glenwood Avenue" (Map). Google Maps. Google. Retrieved June 9, 2016. ^ North Carolina State Highway and Public Works Commission (1961). North Carolina Highway System (Map). [1:823,680]. Raleigh: North Carolina State Highway and Public Works Commission. Retrieved June 9, 2016. ^ a b North Carolina State Highway and Public Works Commission (1963). North Carolina Official Highway Map (Map). 1:20:000. Bynum Printing. Retrieved May 23, 2016. ^ a b North Carolina State Highway and Public Works Commission (1964). North Carolina Official Highway Map (Map). [1:823,680]. Baltimore, MD: A. Hoen & Co. Retrieved June 9, 2016 – via University of North Carolina Libraries. ^ North Carolina State Highway and Public Works Commission (1965). North Carolina Official Highway Map (Map). [1:823,680]. Raleigh: North Carolina State Highway and Public Works Commission. Retrieved June 9, 2016 – via University of North Carolina Libraries. ^ "US and NC Route Change (1972-09-07)" (PDF). North Carolina Department of Transportation. September 7, 1972. Retrieved June 10, 2016. ^ North Carolina Department of Transportation (1974). North Carolina Official Highway Map (Map). [1:823,680]. Cartech, Inc. Retrieved June 11, 2016 – via University of North Carolina Libraries. ^ a b North Carolina Department of Transportation (1975). North Carolina Official Highway Map (Map). [1:823,680]. Baltimore, MD: A. Hoen & Co. Retrieved June 11, 2016 – via University of North Carolina Libraries. ^ a b North Carolina Department of Transportation (1976). North Carolina Official Highway Map (Map). [1:823,680]. Raleigh: North Carolina Department of Transportation. Retrieved June 11, 2016 – via University of North Carolina Libraries. ^ a b North Carolina Department of Transportation (1977). North Carolina Official Highway Map (Map). [1:823,680]. Raleigh: North Carolina Department of Transportation. Retrieved June 11, 2016 – via University of North Carolina Libraries. ^ North Carolina Department of Transportation (1978). North Carolina Official Highway Map (Map). [1:823,680]. Raleigh: North Carolina Department of Transportation. Retrieved June 11, 2016 – via University of North Carolina Libraries. ^ "Route Changes (1984-04-01)" (PDF). North Carolina Department of Transportation. April 1, 1984. Retrieved June 11, 2016. ^ Hoar, Stephen (August 19, 1991). "Beltline Signs Aim to Aid Confused". The News & Observer. Raleigh, NC. p. A1. ^ Rawlins, Wade (September 4, 1992). "Diverting Beltline Traffic Puts Load on Downtown". The News & Observer. Raleigh, NC. p. B2. ^ a b Hoar, Stephen (January 26, 1993). "Next Beltline Phase to Start Work to Tackle Wake Forest to New Bern". The News & Observer. Raleigh, NC. p. B4. ^ a b c Hoar, Stephen (July 9, 1994). "Beltline Widening Accelerates". The News & Observer. Raleigh, NC. p. B4. ^ Hoar, Stephen (August 19, 1991). "Beltline Drivers to Face Lane Shift at Bridge Site". The News & Observer. Raleigh, NC. p. B4. ^ Eisley, Matthew (November 13, 1998). "State Delays Major Raleigh Transit Projects". The News & Observer. Raleigh, NC. p. B3. ^ Siceloff, Bruce (November 30, 2004). "4-Lane Stretch Won't Be Widened Soon". The News & Observer. Raleigh, NC. p. B1. ^ Siceloff, Bruce (March 27, 2005). "Road Plan Imperils Triangle Projects". The News & Observer. Raleigh, NC. p. A1. ^ a b "I-440 Improvements". North Carolina Department of Transportation. Retrieved June 10, 2016. ^ Hyman, Vicki (August 8, 2000). "A Tip for the Confused: Pretend I- 440 is a Clock". The News & Observer. Raleigh, NC. p. B1. ^ "Route Changes (2008-11-10)" (PDF). North Carolina Department of Transportation. November 10, 2008. Retrieved June 11, 2016. ^ Siceloff, Bruce (August 24, 2008). "Redesigned Beltline Signs to Drop 'Inner' and 'Outer'". The News & Observer. Raleigh, NC. p. A1. ^ "I-440 Drops 'Inner' and 'Outer' Labels". WRAL.com. Raleigh: WRAL-TV. March 29, 2010. Retrieved June 12, 2016. ^ "Road Worrier: NC DOT Says to Not Worry About 3 Years of Beltline Misery—Be Happy!". The News & Observer. Raleigh, NC. Retrieved June 12, 2016. ^ ""Crawleigh" Hits I-440 this Week". Raleigh Public Record. Retrieved June 12, 2016. ^ "About Fortify I-40/440 Rebuild Project". North Carolina Department of Transportation. Retrieved June 12, 2016. ^ Siceloff, Bruce (December 3, 2012). "DOT will widen Beltline's last four-lane leg". The News & Observer. Raleigh, NC. Archived from the original on February 21, 2014. Retrieved December 3, 2012. This page was last edited on 28 December 2018, at 22:49 (UTC).